Robert and Aleta Boehm of Campbellsport, Wisconsin, are pleased to announce the engagement of their daughter, Jennifer Rae, to Eric James, son of Ronald and Sandra Crabbe of Wheeling, Illinois. Eric, an Internal Audit Manager at Johnson Controls, Inc., earned a bachelor's degree in Accounting and Finance from Indiana University. Jennifer, a Compliance Officer at U.S. Bancorp Global Fund Services, earned a Master's Degree in Accounting at UW-Milwaukee. 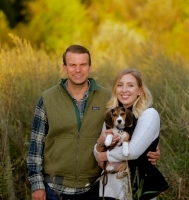 The couple resides in Wauwatosa, Wisconsin, with their Beagle, Noodle, and plan to wed in March 2019.